Late fall or early spring are generally considered the best times to prune these trees; when the sap is down. Fall is probably preferable. Leaf drop is usually indicative of a good time in the fall. This is a guide about, "When should we trim our Japanese maple?". Question: When Should We Trim Our Japanese Maple? We have a 30 year old beautiful Japanese Red Maple tree in our front yard that is getting way too tall and wide. It is getting near wires and hitting the house. When is the best time to cut it back and give it a good trim and shaping? There are many conflicting opinions regarding when to prune maples, so mine may be just one more! All species of maple are known to be bleeders (seep a lot of sap after pruning). 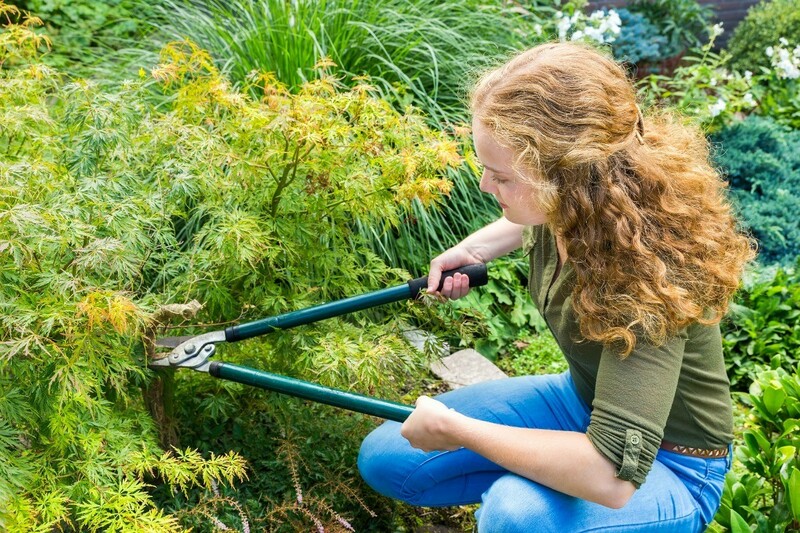 To minimize the amount of seeping, major pruning should be done during the dormant season (after the leaves have fallen). For most gardeners, this will be either in the late autumn after the sap has fallen (November) or early spring before it starts to rise (February/March). Personally, I think late autumn is best. Fallen leaves (and temperatures) are an easy signal. The rising of spring sap seems harder to predict. Pruning your tree during this time may still cause some seeping, but there is less sap movement during these times so it should be minimal. There is also less threat of insects and disease. Above all, make sure to make clean cuts using sharp, sterilized tools. Wounds with clean cuts will form a callus and seal over much more readily than those with jagged wounds. In most cases, it's best not to seal up seeping wounds with tree-wound paint. Most tree experts agree that if any disease spores are present, covering them with wound-paint simply seals them in from the elements and provides them with a safe environment where they can really go to town. Healthy trees are better left to heal on their own. Don't butch it off flat. Instead, reach into the center of the tree and select which limbs must go. This will leave it looking loose and natural, not a lollypop, and will direct the way it grows. Someone made the mistake of planting it where it is, and ultimately you must consider moving or replacing the whole tree. Yes, always prune during dormant months. And -- for that size tree especially, hire a certified arborist who carries insurance! Google "prune Japanese maple" [and most such questions] to find loads of info. What a pretty tree! At our other house a tree in our front yard was touching the phone and electric wires, and we called the electric department. They came out and cut our tree down for us free. Even got rid of the stump for us. We didn't like the tree, it had too many falling berries on it making the ground underneath grassless.